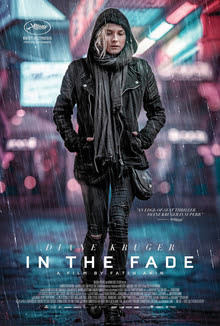 Following the conclusion earlier this week of the five-year-long National Socialist Underground (NSU) trial in Munich, In the Fade (Aus dem Nichts) from German-Turkish director Fatih Akin makes particularly timely viewing. Based very loosely on the string of racist murders committed by the NSU between 2000 and 2007, the film follows widow Katja’s (Diane Kruger) defiant struggle for justice after her Kurdish husband (Numan Acar) and son are killed in a terrorist bombing in Hamburg. Its intimate focus on one family’s story delivers an emotional gut-punch that was always absent from Germany’s dehumanising tabloid headlines which infamously branded the NSU crimes as Döner-Morde (Kebab Murders). The first of In the Fade’s three, deliberately-cleaved acts is a devastating portrait of a broken family, bringing stark exposition to the human cost of right-wing extremism. Its second is an intense courtroom drama which affords a useful and critical insight into the criminal process under Germany’s inquisitorial system. The third turns its sights on the too scarcely-discussed international networks of neo-Nazis and right-wing extremists that stretch from Germany to Greece. Along the way, unfortunately, much is introduced and then left unaddressed. Katja’s conflict with family, lawyers and her relationship with recreational drug use is seemingly introduced to flesh out her character, then discarded without further reference. Perhaps this was deliberate – denying meaningful closure to the audience in the same way it was denied to Katja by the death of her family. The frequent denial of catharsis does strengthen the film’s staying power. It’s important that neither Katja nor her late husband, a rehabilitated drug dealer, are perfect, unflawed people. Too often in today’s political climate, the transgressions that make us human are used to justify stripping thousands of their humanity. Germany’s police, whose conduct came under scrutiny during the real-life NSU trial, are implicitly criticised when they are shown stubbornly standing by their instincts that the film’s murders are linked to gangsters or Islamists. It should surprise readers none that In the Fade makes tough viewing. This is cinema as imperfect polemic, not escapism. But as Europe continues to stumble from one political crisis to another, we need powerful reminders like this of what awaits down the road of nationalistic hatred that still tempts too many. Brace yourself, but see it.